The death of the 'local rag' has been predicted many times before, and with the Nine-Fairfax merger on the horizon their viability is once again in the spotlight. In this crossposting from The Conversation, Ian Willis looks at the future of regional media. 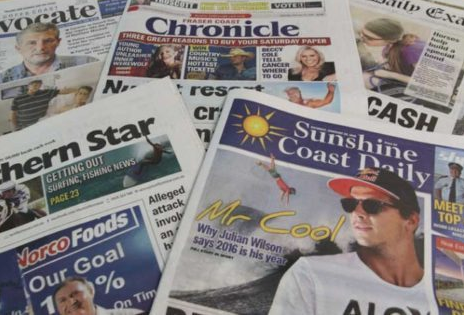 Media commentary has justifiably questioned the continuation of quality journalism and editorial independence of the metropolitan dailies in Sydney and Melbourne. Yet there has been a silence on the threat to small country and suburban mastheads. The Australian Community Media division of Fairfax Media controls 16 Sydney suburban mastheads, around 110 local newspapers across New South Wales and ACT and a further 50 or so local mastheads across the country. Media consolidation and rationalisation threatens the viability of these small community newspapers. Studies in the United States have shown that communities suffer when local newspapers shut their doors. The level of scrutiny of government declines, along with governance standards and the health of local democratic processes. But will the local newspaper actually disappear for good? British newspaper historian Rachel Matthews has stated that the death of the local newspaper has been predicted more than once over the past 250 years. Local papers have a long history in Australia. Newspaper historian Rod Kirkpatrick states that the first regional newspapers outside the capital cities appeared in Launceston in 1825, Geelong in 1840 and Maitland in 1841. Some local newspapers became part of family press dynasties across rural Australia, and local press barons protected their interests by forming country press associations to lobby colonial governments. Journalism in local colonial newspapers was driven by parochialism and notions of progress. Little has changed today. The essence of local newspapers is that they are a mirror of the small communities that produce them. Regional historian Louise Prowse says the local newspaper is central to the life of country towns. Country and suburban journalists and editors are embedded in their communities, and as Belinda Sanders, the editor of the District Gazette in regional NSW, points out, readers have direct access to them. Lee Abrahams, the owner and editor of the The District Reporter in Camden, NSW, aims to tell the “local people about their local area and their stories are part of that agenda”. Some suggest that a new business model is already emerging. British academic journalist Richard Sambrook has suggested that with “highly targeted journalism, local cost operations can work”. Reports of the emergence of free regional newspapers are positive signs of the endurance of the local newspaper model. Cheryl Newsom, the editor of the Canowindra Phoenix, another small-town NSW paper, says the focus is on “telling positive stories from regional NSW, keeping the local community at its centre”. The Phoenix is published every Thursday in the community of Canowindra, population 2,300. Around 500 copies are letter-boxed, 360 delivered to roadside mailboxes and another 440 droped at businesses in surrounding towns. There are 1,100 email subscribers, and readers can also follow the newspaper on Twitter, Instagram and Facebook. The Phoenix group has local editions at Canowindra, Forbes and Parkes with circulations of 2,000, 3,000 and 3,500, respectively. The Parkes edition was launched in March 2016 and Forbes in July 2015. Another edition was launched in Hilltop and later sold. Publisher Sarah Maynard says the Phoenix group employs a staff of 12 and attributes the success of the newspapers to them being free, as “no one wants to pay for news anymore”. The newspapers support the local community and the newspapers receive strong support from regular advertisers, particularly local councils. In recent years, there has been extensive rationalisation and consolidation within the country press mastheads of the large media companies and the loss of journalists’ jobs. Even with these uncertainties and the threat of further cost cutting with the Nine-Fairfax merger, there are those who have confidence in future of the local newspaper. Deputy Prime Minister and Nationals leader, Michael McCormack, recently said that “regional newspapers are still viable and have a future”. …country newspapers are still thriving. They’re doing it because they’re producing the sort of parish-pump stuff that isn’t available anywhere else and good luck to those little rags. Even in the age of digital disruption and media consolidation, there are green shoots and new mastheads. Ian Willis, Honorary Fellow, University of Wollongong. This article was originally published on The Conversation. Read the original article.